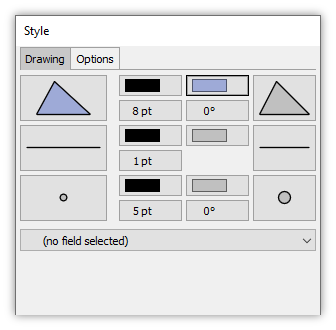 Using the Style panel in the Contents pane we can set the display characteristics of areas, lines and points in a drawing. See the Style: Labels topic for information on styling labels. See Style: Images for how the Style panel works with images. The Style panel does simple things right away, hiding more controls until they are needed. Style applies to an entire layer - Change a parameter and it instantly changes style objects throughout a layer. Controls to change the style of individual objects within a layer will appear when we want them. Change basic properties quickly, or compose combinations - Dedicated buttons change basic properties instantly. The Total Style button changes many properties at once, composing a new look. We can mix the two approaches. Style settings applied to drawings are also known as formatting. Changing basic style properties, such as fill color or symbol, lets us create whatever overall effect, called the total style, we want. Thematic Formatting - Automatically change style for each object within a layer using a field. Style Overrides - Manually change the style for each object within a layer. 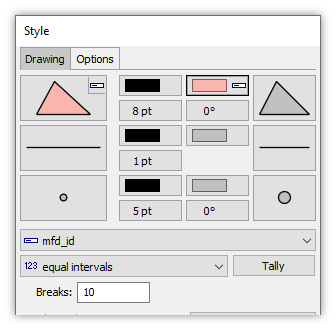 Style: Areas, Style: Lines, Style: Points - The Style panel makes it easy to change top level, basic characteristics. To do more, we drill down into the full Style dialogs that are illustrated in these topics. Open the drawing or click onto the drawing's tab in an open map window. Open the Style panel in the Contents pane. Click on the button for the Style property to be changed. Change the property as desired. Press the Esc key or click anywhere outside the button menu to cancel. The change will automatically be applied to the drawing. 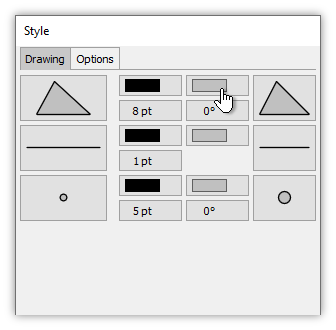 The Drawing tab shows style property controls. The Options tab provides controls for style overrides. Buttons without any extra sub-icons apply that same setting throughout the entire layer. Clicking the button by default will show a drop down menu providing typical, one-click choices. To see a field choice box allowing choice of a field for thematic formatting, simply click back into the Style panel outside of the drop down menu. Buttons that show a small "field" sub-icon have their style property controlled by a field, using thematic formatting. Clicking the button by default will show the thematic formatting arrangement and controls in the Style pane. To get a drop down menu providing typical, one-click choices, simply click the button again. Buttons that show a small "box" sub-icon indicate that style property has style overrides enabled, allowing manual setting of style properties on individual objects within a layer. A button showing the combined effect of the other properties to create the illustrated Style for areas, for lines or for points. Often simply called Style. The primary color applied in point and line styles that use a single color. Also applied to the borders of areas, to the borders of point styles that use two colors, as the hatch line color in area styles, and as the primary color in line styles that use two colors. Important: Setting Stroke color to transparent makes objects disappear completely. To render a style without using Stroke color, use the Symbol button to drill into the Symbol menu and set the Stroke width parameter to a very small width, such as 0.1. The fill or secondary color. Applied to the interior of area styles. Also applied as the secondary color in area, line and point styles that use two colors. The size of point objects, the thickness of lines, and the sizing of hatch patterns for areas, by default expressed in printer's points. May be fractions such as a size of 0.1 or 2.8. Enables specification of the density of hatch patterns and other area style symbology. The drop down menu provides a range of default choices. 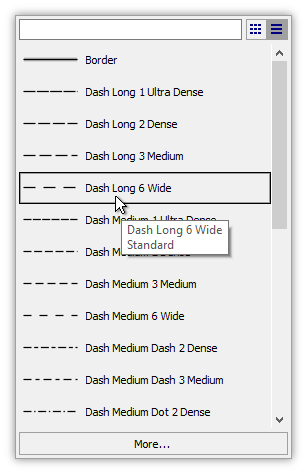 Enter a specific value into the box to specify a Size other than one of the default choices. The rotation in degrees. Rotates the hatch pattern of areas and rotates the entire symbol of points. Lines do not use Rotation. The drop down menu provides a range of default choices. Enter a specific value into the box to specify a Rotation other than one of the default choices. 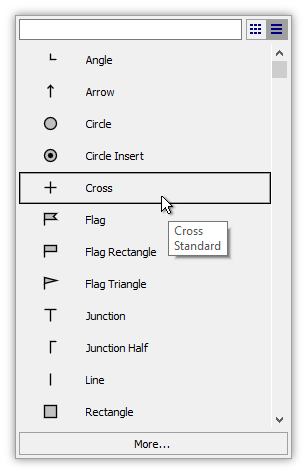 Choose symbology for areas, lines or points. The drop down menu provides a range of default symbols, with a toolbar that allows configuration of the drop down menu. Press the More... button at the bottom of the drop down menu for the full Symbol dialog that provides more options. Settings in the Style panel, such as fill color for areas, by default apply to all objects in the layer. If we change the fill color for areas to slate blue color, all areas in that layer will have a fill color of slate blue. That makes it easy to change the appearance of every object in a layer, instantly. Use thematic formatting to vary style properties per object based on the value of a field in that object's record. A classic use of thematic formatting, for example, is to make the point symbol for a city larger or smaller depending upon the value of a population field for each city. In the Options tab of the Style panel, turn on Style: Overrides. We can then specify style properties for individual objects that will override settings specified in the Style panel for the entire layer. For example, we might want to make the point symbol for the capitol city of a country very much larger than other points. See the Style: Overrides topic. To apply thematic formatting, we choose a field in the drop down menu that appears when we have formatted some style property, such as fill colors for areas, and then we set the desired style for each of the intervals. See the Style: Thematic Formatting topic. When we choose a field, like the mfd_id field in the example above, the style buttons that use a field will have a field icon added. 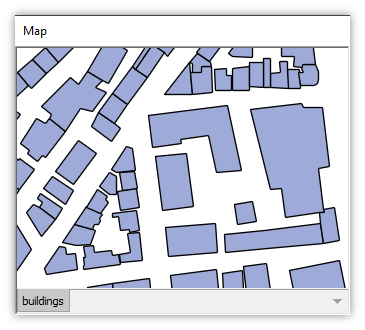 Make basic changes quickly - Changing basic properties like fill color or symbology is job one in any GIS work. The smaller buttons at the right of the Style panel allow us to instantly change basic properties. Changes in basic properties apply instantly to the layer. Compose combinations all at once - One change at a time is OK for most workflow, but sometimes we prefer to change many properties at once to get the look we want. The big, Total Style buttons at the left of the Style panel do that for us. They allow us to change all of the style properties at once, using a preview pane to show the combined effect before we commit. The Total Style buttons also show the total effect of any changes made with the other style properties buttons. 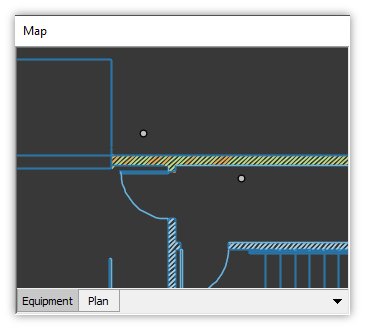 Manifold drawings can contain areas, lines and points in the same layer, so the Style panel has similar controls in three sections, one for areas, one for lines and one for points. The left-most, total Style button is a larger button that shows the total, combined style that results from choices made for basic style properties. The smaller buttons to the right show the basic style properties that make up the total style. Because symbols can be complicated, the Symbol property buttons for choosing a symbol are larger than the properties buttons for colors, size, or rotation. Areas, lines and points each have a total Style. We compose a Style by choosing Stroke Color, Fill Color, Size, and Symbol properties. Area styles and point styles also have a Rotation property. Line styles do not have a rotation property. Changing a basic property is easy: we click the button and choose what we want. Buttons launch a drop down menu with the most popular choices. If we want more, we click More... at the bottom of the drop down menu and then we get even more choices. Style controls for points are shown above. The Total Style button adds up all effects to preview the combined result. If we want to change the Fill Color, the Symbol, the Size and Rotation, we can click those buttons in turn and choose what we want. In the example above, we have picked a bright green color for Fill, a fire extinguisher Symbol, a Size of 36 points, and a Rotation of 15 degrees. With each change, the result is applied immediately to the drawing. See the Example: Change Point Style topic for a more detailed, step-by-step example of the above. Sometimes we want to change everything at once, using a preview in the dialog before committing changes. That is what the Total Style buttons allow us to do. Suppose we start with a drawing, called Equipment, that marks the locations of fire extinguishers in the plan of a theater. We want to change the default formatting of small gray dots to a more visible symbol. We click directly on the total Style button. A drop down menu shows popular choices. If a thematic format has already been assigned to the total Style button, that thematic format arrangement will appear instead of a drop down menu. To get the drop down menu, simply click the Style button again. 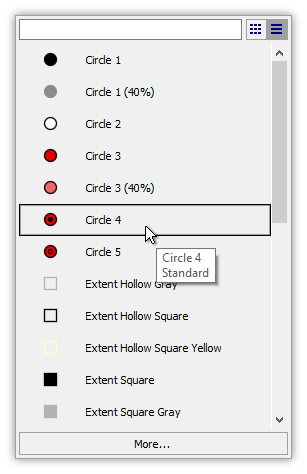 The Point Style dialog allows us to choose Stroke and Fill colors, Size, Rotation and the Symbol. It provides many more controls for various style options for points. It also allows us to quickly choose a background for the preview pane's canvas, so we can see what our proposed style will look like in the actual layer. If we like the effect we press OK, or Cancel if we do not want to apply the changes. Using simplified illustrations, we show what the Size property does for points, lines and areas. A default size of 5 points shows points as small dots. Changing the Size to 16 points increases the size of the points. Clicking onto the Symbol button in the Style panel, we can create thematic format as seen above, left, using different symbols for different field values in the points of interest layer, drilling down into the full Symbol dialog to use symbols from the Glyphs collection as discussed in the Style: Points topic. The symbols used are very simple, just a slight drop Shadow effect and no halo or box effects, as more complex styles might use. 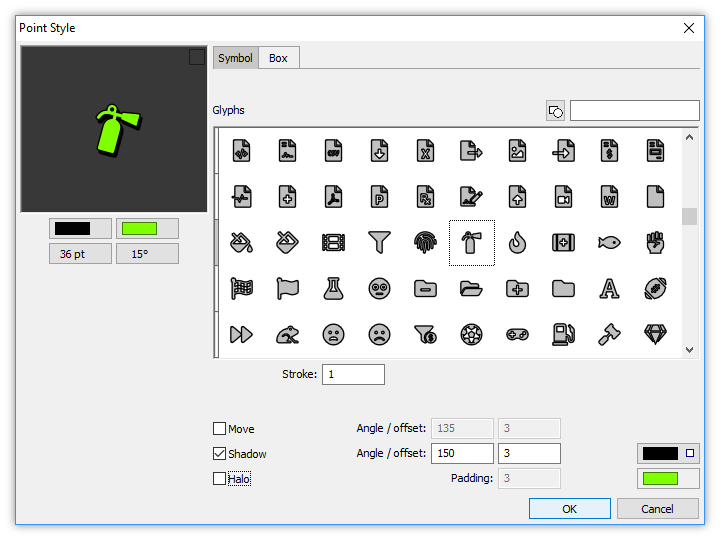 If we prefer bitmaps, or a mix of bitmap images and vector symbols, we can use bitmap image symbols as discussed in the Style: Bitmap Symbols topic and seen above at right (using a random collection of images). 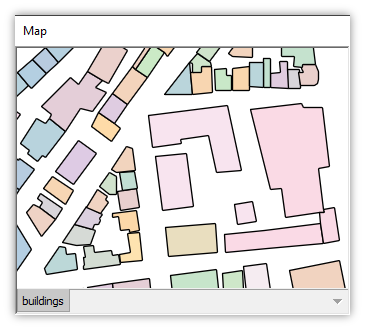 In both of the images we have added a background, buildings layer, seen using 20% opacity set in the Layers pane. A default Size of 1 point shows thin lines. We could use an even thinner size, such as 0.5 points, but lines much thinner than one point can be difficult to see. The small "field" icons in the buttons indicate a thematic format is being used to vary the Stroke color of different lines by a field. Changing the Size to 2 points results in thicker lines. We can drill down in the Symbol button to the Symbol dialog for points, as shown in the Style: Lines topic, and check the Halo box to apply a halo in black color with Padding of 0.5 points. That will render each line with thin black borders as seen above. The full Symbol dialog for line styles allows us to many more effects, such as repeating symbols for the line, as seen at left, or to add left and right accessory lines and dashed lines with halos, as seen above. 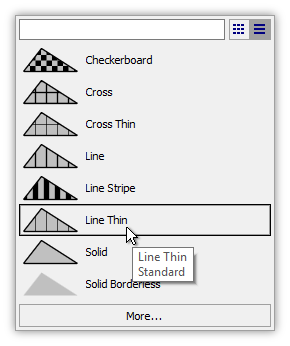 The Symbol dialog for lines also allows adding symbols at the beginning or end of lines, as seen above. Size with areas sets the spacing of hatch patterns. For example, when the Symbol button is used to apply a mesh hatch pattern to areas, the default Size of 8 points results in the mesh size seen above. The small "field" icons in the buttons indicate a thematic format is being used to vary the Fill color of different areas by a field. If we change the Size to 4 points, the mesh size becomes smaller, using half the spacing between horizontal and vertical mesh lines as was used with a Size of 8 points. The Rotation property changes the rotation angle of patterns applied to areas. Using the default Rotation angle of 0 degrees, a vertical thin line hatch pattern applied using the Symbol button results in lines that are aligned exactly vertically. If we change Rotation angle to 60 degrees, the hatch pattern now is rotated so the lines are at a 60 degree angle to the vertical. 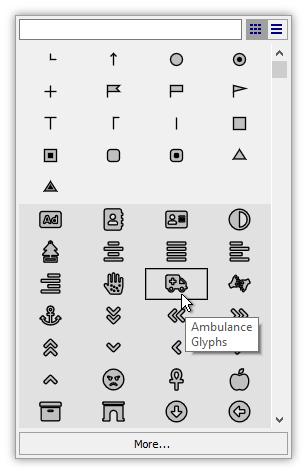 In the Style pane we can click on the Symbol button to drill down into the full Symbol dialog, to add effects as illustrated in the Style: Areas topic. For example, we can use a subtle Inner effect as seen above, left, or we can utilize bitmap image symbols as area fills, together with use of Border and Outer Border effects as seen above, right. Clicking a style panel button launches a drop down menu that allows a quick choice with one click. The examples below show drop down menus that appear for colors. Drop down menus for Symbols and Total Style are similar. Drop down menus offering one-click choices appear if a thematic format has not been assigned to the total Style button. If a thematic format has already been assigned to the total Style button, that thematic format arrangement will appear instead of a drop down menu. To get the drop down menu, simply click the button again. 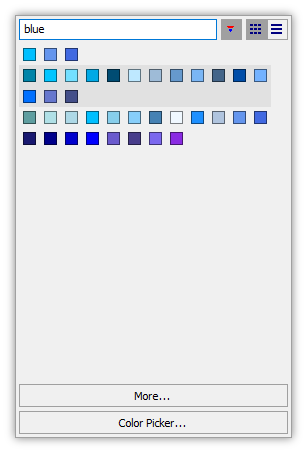 When clicking a color button, such as the Stoke Color or Fill Color, a drop down menu appears showing color samples that may be chosen with a single click. Up / Down keyboard arrows and Page Up / Page Down buttons scroll the display. 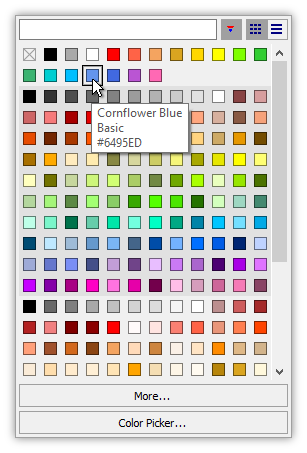 A toolbar at the top of the drop down menu allows us to rapidly find and arrange colors, with arrangements normally being remembered. Hovering the mouse cursor above a color will report in a tooltip the name of the color, the group and the hexadecimal color. 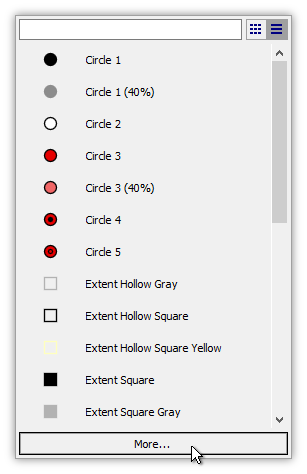 Color groups are indicated by varying the gray background from lighter to darker gray. Basic colors are those in prior versions of Manifold. 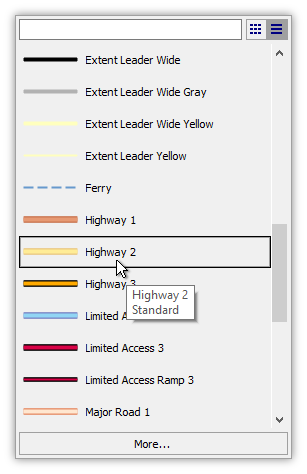 Standard colors are those which have become popular in classic GIS packages from industry leaders. Web colors are the standard selection of named colors used in web page programming. Upcoming builds will likely enable addition of other groups of colors, for example, from other industries, from other famous applications or as compiled in custom collections by users. Show only those colors whose names contain the given string, case not significant. Sort - Toggle sort order of colors either by hue or alphabetically by name. Grid - Show colors as a grid of color samples. 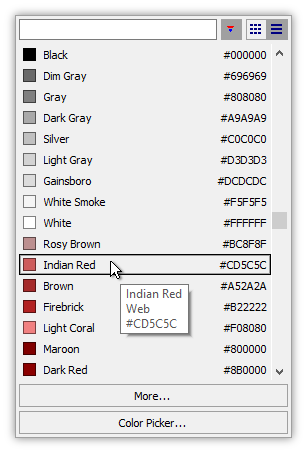 List - Show colors as a list with a color sample, the name of the color, and the hexadecimal code for that color. 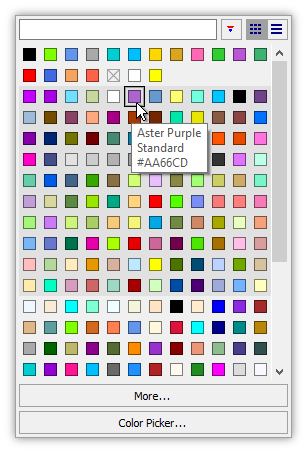 Open a full dialog for picking any color desired. Everyone's favorite tool: Click the Color Picker button and the mouse cursor changes to an eyedropper shape with a slightly lighter shade overlaid on all monitors to indicate every location that might be touched. Click with the eyedropper on any pixel anywhere and that color will be picked. We can click on Windows status bars, on open dialogs, onto other applications or anywhere visible on any of our monitors. Entering blue into the filter box shows only those colors with "blue" in their names, case not significant. Colors are displayed using whatever are the toolbar button settings. The Grid layout is shown on the left and the List layout is shown on the right. 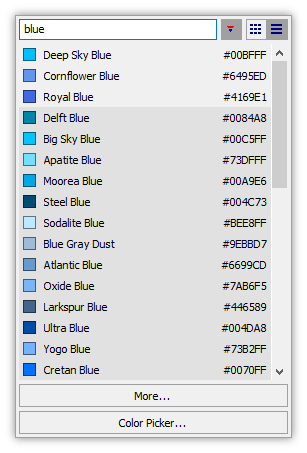 Pressing the Sort button displays colors sorted by similar hue, within groups. Releasing the Sort button displays colors sorted alphabetically by name, within groups. Clicking the List button shows colors in a list, providing the name and hexadecimal code for each color. Clicking the Grid button restores the grid view. Clicking a Symbol property button for points, lines or areas launches a drop down menu, similar to those used for colors, that allows a quick choice with one click. Choosing the More option at the bottom opens up a full Symbol dialog with more options. Drop down menus offering one-click choices appear if a thematic format has not been assigned to the Symbol button. If a thematic format has already been assigned to the Symbol button, that thematic format arrangement will appear instead of a drop down menu. To get the drop down menu, simply click the button again. Switching from List to Grid display makes it easier to see more points. The Glyphs collection provides hundreds of symbols. It is followed by a Brands collection providing well known logos. A good way to find symbols is to use the Filter box to filter by name. Line symbols also have names. The Standard collection provides typical symbols used in classic GIS. 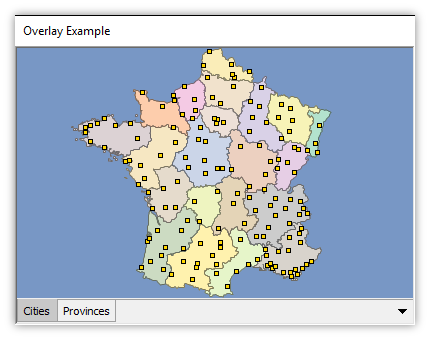 The Standard collection of Area symbols provides typical area fill patterns used in classic GIS. There are no horizontal or inclined angle hatch patterns since those are set using the Rotation angle, using 90 degrees for horizontal lines, for example. Total Style buttons for points, lines and areas allow us to specify all style properties at once. 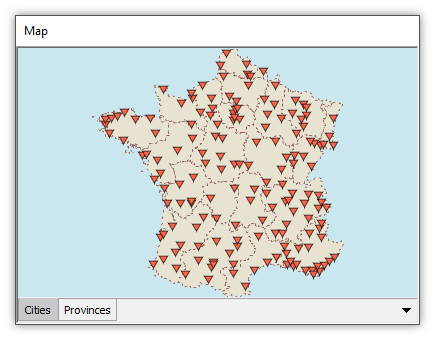 The choices in the drop down patterns provide typical combinations, the Standard collection, often used in classic GIS. Total Style combinations allow us to specify colors and all other style properties, so the very many symbology options for points can provide symbology for any need. 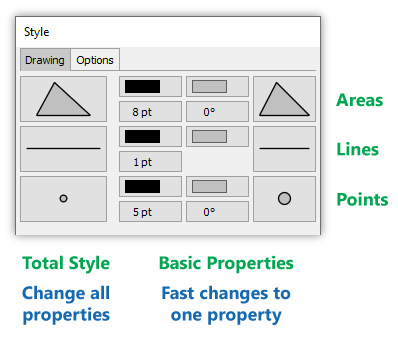 In the illustration above, we have scrolled down into the drop down menu to see various combinations of properties that provide standard cartographic lines. 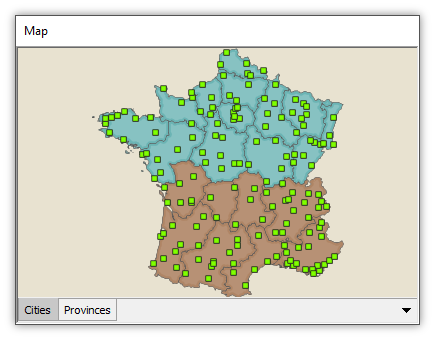 Area style combinations also follow naming conventions for standard cartography from classic GIS. By varying the settings of a few, basic style properties we can create a seemingly infinite variety of appearances. The four drawings below use the same map with the same drawings but with different Style settings for the drawings. The overall background color is set in Contents - Layers. Drop down menu or thematic format? - The default desire in most cases is to simply click a button and to change a style property. By default, clicking a button opens a drop down menu with one-click choices to do that. If we have already applied a thematic format to a style property we usually want to tinker with that thematic format, so clicking a button that has a thematic format on it will immediately display the thematic format arrangement. We can get a drop down menu with one-click choices by just clicking the button a second time. Undo for Changes - Suppose we love the ability to instantly change fill color for areas, but when a change we make results in an ugly effect we want to get the previous color back? For now, make a copy of a drawing before any changes (takes but a second in the Project pane). Upcoming builds will provide a "Back" capability to get back the prior color. 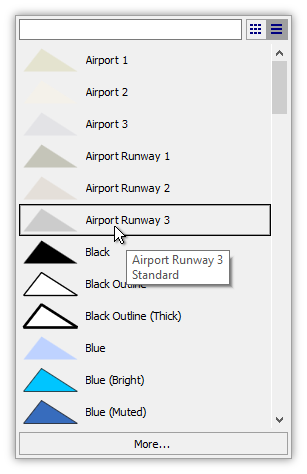 Not a Legend - Because the Total Style button shows a preview of the combined effects of individual basic properties, the Style panel provides a quick and dirty legend. Much better will be the formal Legend capabilities that will soon appear in upcoming builds. 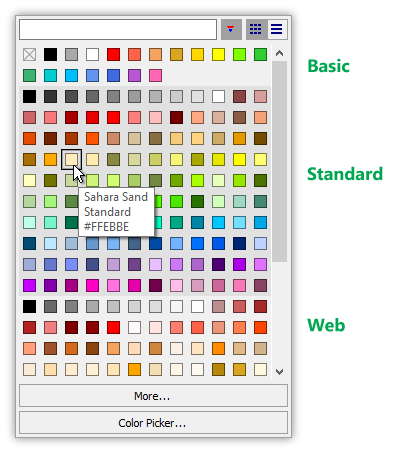 Transparent colors - The first "color" in drop down color menus, represented by a box with an X, is transparent color. Using that color for an object makes invisible those parts of the object using transparent color. Setting Stroke color to transparent makes the entire object disappear. To render a style without using Stroke color, use the Symbol button to drill into the Symbol menu and set the Stroke width parameter to a very small width, such as 0.1. Use transparent color with care. See the discussion in the Example: How Not to Format a Drawing topic. Nomenclature - The word format is traditionally used in GIS to mean display characteristics. A more contemporary word is style, hence the name of the dialog in Manifold. In this documentation we normally use the words style and format as interchangeable synonyms, albeit with style used more often to refer to patterns, such as icons for points or hatch patterns for areas, with format being a broader term to refer to any display characteristic. Rotation - It doesn't make sense to choose a Point rotation value that ends up presenting the selected Point style with the same appearance. For example, choosing a Point rotation value of 90, 180 or 270 will make no visual difference in the appearance of a square, which looks the same rotated 180 degrees as it does without any rotation. Manifold 9 - Style Panel Quickstart - Points - A fast and easy introduction to the new Style and formatting capabilities for Pionts in Manifold Release 9 and Viewer. Learn how to rapidly change colors, symbology, sizes and rotations including the use of vector symbols, fonts and even bitmap images. The new system is "always on" and immediately shows changes in the main workspace for rapid, easy choice of exactly the visual effect we want. This video gets right to the basics used every day. 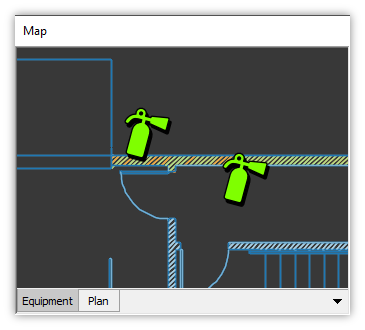 Manifold 9 - Style Panel Quickstart - Lines - Learn how to use the spectacular new style capabilities for lines in Manifold Release 9 and Manifold Viewer to create an endless variety lines quickly and easily. See how to add arrowheads or other symbols to the ends of lines, how to customize lines with repeating symbols, how to start lines with custom symbols and how to add accessory left and right lines for exactly the right effect. Manifold 9 - Style Panel Quickstart - Areas - New area style capabilities in Release 9 and Viewer make it easy to rapidly create spectacular visuals that get the story across with clarity and compelling effect. Learn how to use point and click controls to fill areas, control borders, draw "inner area" effects and "outer area" effects for a seeming infinite range of options, all available with a rapid click of the mouse. Use bitmap images for area effects too! Manifold 9 - Style Panel Quickstart - Labels - Recent builds of Release 9 have added extensive new style facilities for labels, making it easy to choose a wide variety of effects, including sidecar icons, box frames, drop shadows and many others. This video shows how fast and easy point-and-click dialogs make it easy to create exactly the label look you want. Works for the free Manifold Viewer, too! Manifold 9 - Bitmap Styles - A quick, first look at very extensive additions to Style, enabling use of bitmaps for styles, inner and outer area hatches, left and right line style additions and many other new features.